What Does January Smell Like? To embrace the seasons, since about October, I have enjoyed a scented candle from time to time. I have had two big jar candles that I have alternated, depending on my mood that echo the sounds of the seasons, except you know, they smell like the seasons–a Maple Bacon (yes, I’m for real, and it is wonderful!) and a Gingerbread. I just love the warm, vibrant, comforting scents of the fall and Christmas. As good as the Maple Bacon smells, the Gingerbread must be my favorite because it, ironically enough, burned completely out last night. I looked to see if I had another one and found that I do not. *sigh* I guess it’s time to let it go, isn’t it? I love the way the smells trigger memories. I read somewhere that smell is strongly related to memories. I don’t know if that’s true or not, but I do know that certain smells can carry me back in time. I smell a certain spice, and I think of my Daddy (don’t ask me why). The smell of a certain lotion brings back hugs and Mama’s hands. My Great Aunt comes to mind when I smell white Dove soap. The smell of squash cooking in the summertime carries me back to the summers of my childhood. The smell after a cool rain in the evenings takes me back to softball fields of my youth. And so many more. Today as I was finishing up a knitting project (yes, FINISHING! whoo hoo), I had a Christmas movie on the tv. Despite the fact that this station is still playing Christmas movies, their advertisers have definitely moved into the New Year. Not a single “After Christmas sale” advert–but they were abundant in diet and weight loss commercials. Oh boy. That makes me nuts. So yes, January is well on its way, bringing with it a new number to remember when we write the date. And it also brings with it all kinds of good intentions and pressures to change our ways. Never mind all that this year (or next, as the case may be). As I’ve shared before, I’m going to make January all about “Congratulations, you’ve made it!” instead of “How will you change all of your wrong ways about you?” January and I are not close enough, never have been, for her to be asking me questions like that. 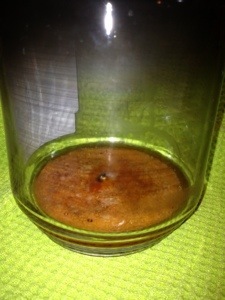 As I was cleaning up the kitchen earlier, I looked at the empty Gingerbread candle jar. I wondered what scent I would look for now. Which one? I mean, really, what does January smell like? Crisp and clean? Subtle and light? Nothing at all? I have no idea. But I’m pretty sure it’s not Maple Bacon. If you have any ideas, please do share. I have three days left to figure it out. I’d really like to enter the New Year with light all around me. I have a feeling I’m going to need it. Merry Fourth Day of Christmas! Love and light and good memory-triggering smells to all.